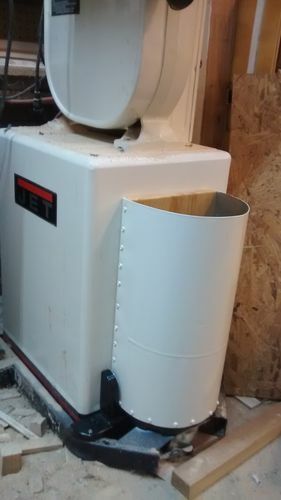 Any recommmendations on a shop trash can? I’ve tried several standard plastic round trash cans over the years, and they always seem like putting a large round peg into a smaller square hole. Too high to fit under bench top… don’t fit in corners. yadda yadda, driving me crazy. What do you guys and gals do? I use paper yard bags. I roll the bag down to about 10” high to start, and as I fill it I keep unrolling until the bag is full … tape it shut and sit it on the street with the trash. It takes me about a month to fill a bag. 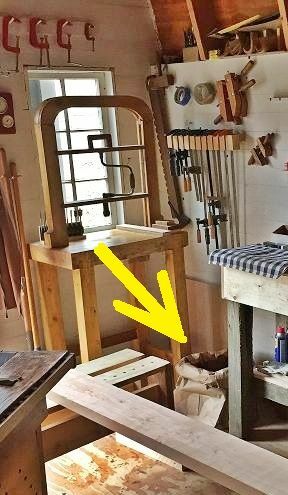 Most of the time the bag lives under my drill press. I use the cheap plastic buckets sold by Lowes and Home Depot. I put one at each machine and place where I can throw trash and cut-offs. Periodically I dump all of these into a big plastic trash bag and take it out to the garbage. 5 gallon buckets at certain machines here. 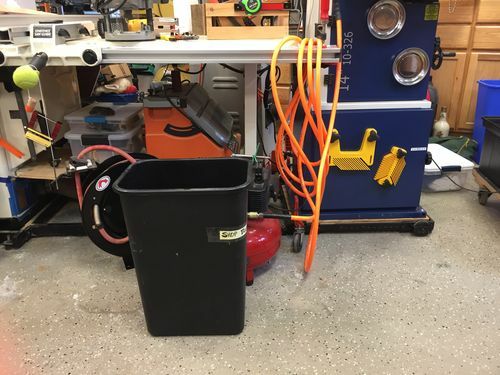 a simple rectangular trashcan for bigger cutoffs, then a simple rectangular plastic trash can conveniently located for stuff that doesnt go to the fire pit. One mistake I have made in the past is to get a big Rubbermaid trash can. When it’s full, it’s too heavy to take out. Smaller trash cans obviously fill up faster, but at least you can dump them without throwing your back out too. I would think something around 13 gal rectangular would be a good compromise between volume and weight and fit well between other tools. I also have to agree with the orange bucket idea too. I have several that hold my smaller clamps. 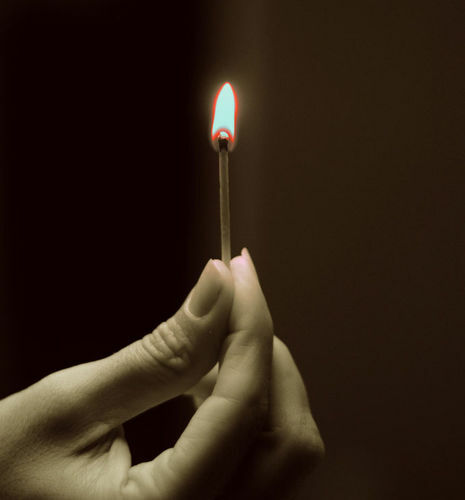 Since we now have a wood burning fireplace, I’ve started burning everything but pressure treated wood, which has really reduced my rubbing output. A large trash can didn’t work for me: not in the right place, takes up too much space, gets too heavy, and so on as discussed. I’ve now got four black plastic cans spread around my 21’x21’ shop, where i most often need them. These are nominally 21×15x11 inches, bought at a big box hardware store. Three of these are reserved for dry, “clean”, trash. They hardly ever need to be rinsed, but sometimes I do so. 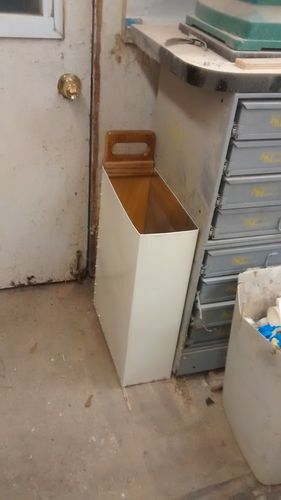 This size tucks under edges of workbenches or saws or other stuff. I have a label on each that says “Shop Trash”, which helps to get them back to where they belong, and not put into service for some location around the house or yard. 25 gal brute on a dolly, for the biggie, and of course the 5 gal units all over, clutter, its what i do, seems like there is always clutter, no matter how much i try to organize. I am currently using 55 gal steel drums and I do not recommend them. Too heavy, too much floor space, too hard to transfer contents to a bag when needed. If you got cats you got plenty of empty plastic kitty litter cans! That is an unusual “drill press” with the bit brace. I have never seen anything like it. Is that something you designed or was it a common old woodworking tool? I think there are companies selling retired whisky and bourbon barrels. Seems like the Schwartz got one as a present from his wife once upon a time that he uses for shop trash (the barrel, not his wife). Actually, a little of both, Mr. Ron. Please see the thread … Building a Hand Crank Drill Press. Good old fashion metal trash can.